Particularly if you are visiting Philadelphia for the first time, we enthusiastically recommend the Walk! 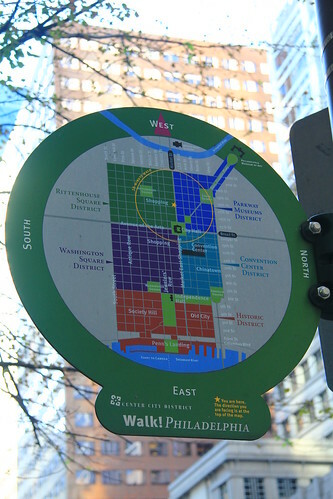 Philadelphia Maps and Signs, in order to familiarize yourself with the street grid, and how to get the most out of your finite time, while visiting the city. The photo at the top of this page, was taken of the Walk! Philadelphia sign at the intersection of 17th and Market Streets. Look For the Gold Star - "You Are Here"
Each map will have a gold star - that is the "You Are Here" indicator. Each map will also have a gold circle, surrounding the gold star. That circle indicates - approximately, of course - how far a ten-minute walk from the gold star, will take you. The Walk! Philadelphia Maps Are Not Always Oriented "North"
Helpfully, they are oriented in the direction you are facing. The photo above has "West" at the top, since that is the way the pedestrian reading it is facing. Note that the Red Historic District is at the bottom - "East". We are impressed with the choices that Center City District made, with how the names of the neighborhoods were selected, and where the borders begin and end. We should note that some of these neighborhood names are in common usage, among Philadelphians - several examples are Old City, Penn's Landing, Society Hill, and Rittenhouse Square - everyone agrees where they are. However, if you ask someone on the street, "How do I get to the Washington Square District? ", that person may not be familiar with the official terminology. Nonetheless, we recommend that you stick to the signs, as the official names are the best way of learning, particularly when you're just getting started, with your explorations of Philadelphia. Philadelphia City Hall - located at the intersection of Broad and Market Streets - is the geographical heart of Center City Philadelphia. If you look up at the map at the top of this page, you'll notice a gold square directly in the center. This is City Hall, located at the center of four of the five color-coded maps - Parkway Museums District, Convention Center District, Washington Square District, and Rittenhouse Square District. The Philadelphia City Hall Tower - which you can tour, and take an elevator ride to its observation deck, literally in the hat of the 37-foot-tall William Penn Statue - is a great way for you to always have your bearings, while walking around Philadelphia. The enormous tower will always be in the dead center of the city, and until 1987, had remained the tallest point in the Philadelphia skyline. Center City District has conveniently bundled the three adjacent areas of Old City, Penn's Landing, and Society Hill into its Red - Philadelphia Historic District. East - the Delaware River and Front Street/Columbus Boulevard (the equivalent of "First Street"). The rivers are in light blue on the map. We'd recommend our Philadelphia Historic District Main Page - which has the fundamental information, for exploring the red areas on the map. We've created separate pages for all three areas, and we'd recommend that you take a look at each, to learn more about what to see in each of them. There are many things to see and do in the Washington Square District, with Washington Square - of course - being the main one, as it is very beautiful, adjoining the major patriotic shrines, and the Tomb of the Unknown Soldier of the American Revolution is located there. There is also a broad variety of bars and restaurants in this section. It is anchored around the Pennsylvania Convention Center - a large complex centered on 12th and Arch Streets, which is shaded black on the map. It is adjacent to Market East Station - located at 11th and Market Streets, and with the smorgasbord available at Reading Terminal Market - located across the street. It also encompasses the Chinatown neighborhood. We'd like to recommend that you visit our Convention Center District Main Page - which has all of the information of interest to not only a visitor to the Pennsylvania Convention Center, but anyone visiting Philadelphia. The Parkway Museums District derives its name from the Benjamin Franklin Parkway - the magnificent, Parisian-inspired boulevard which runs in a diagonal, starting from City Hall at Broad and Market Streets, and culminating in the equally magnificent, stunning Philadelphia Museum of Art - located at the intersection of 26th Street and the Ben Franklin Parkway. In addition to its world-class art collection, it has also been made famous, worldwide, as the home of the Rocky Steps - the series of films by Sylvester Stallone, a native Philadelphian. The Parkway Museums District is also home to many of the city's most prestigious cultural institutions, such as the Franklin Institute - a dazzling, cutting-edge science museum, located on the beautiful Logan Circle - home of the breathtaking Swann Memorial Fountain. Whether you want to head through the largest heart in the world at the Franklin Institute, or race up the Rocky steps, we'd like to recommend that you take a look at our Parkway Museums District Main Page - which offers a great deal of information on this huge district, which runs from City Hall Tower, at Broad Street and the Parkway - the equivalent of "14th Street" and the Parkway - all the way up to the Museum of Art, at 26th Street and the Parkway. East - Broad Street (the equivalent of "14th Street"), also known as the Avenue of the Arts. The main attraction is, naturally, Rittenhouse Square - a leafy oasis, which has been synonymous with Philadelphia high society for over a century. In addition to the impressive architecture of the area, Rittenhouse Square is also lined with high-end hotels, and an eclectic collection of bars and restaurants. We recommend that you visit our Rittenhouse Square District Main Page - which has a comprehensive guide of everything to see and do in the Rittenhouse Square District. If you'd like to leave the Center City District, and return to the Home Page of Enjoying Philadelphia, please click here.